How Would You Spec Your Scrambler? 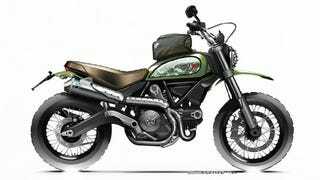 The Ducati Scrambler comes in four flavors, but as I found out this week, there are no mechanical differences between them. It's the same engine, the same suspension, and the same frame holding it all together. And that means you can pull any bit from any bike to create your own. It's like a two-wheeled LEGO kit, so let's see what you can build.